Altair Semiconductor and AsiaTelco have announced development of a TD-LTE mobile hotspot for China Mobile, which incorporates Altair's TDD/FDD LTE chipset - the FourGee-3100/6200. This is the second TD-LTE device announced by the two companies, following their demonstration in June of a TD-LTE USB dongle. 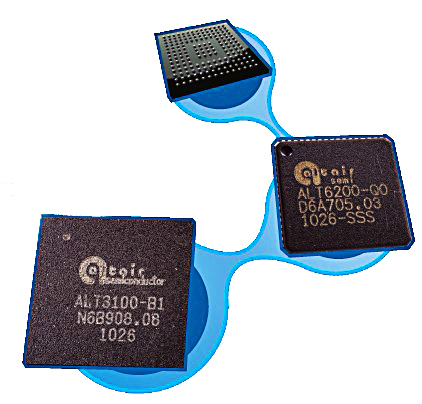 The FourGee-3100 is Altair's LTE baseband chip, which the company packages in a 9x9mm VFBGA package. The FourGee-6200 provides the companion LTE RF front-end, in a 8x8mm QFN package. According to the Altair press release, the "ALM-F190 is the first Mobile Hotspot product designed for both TD-LTE and FDD-LTE, capable of delivering 100Mbps downlink and 50Mbps uplink." 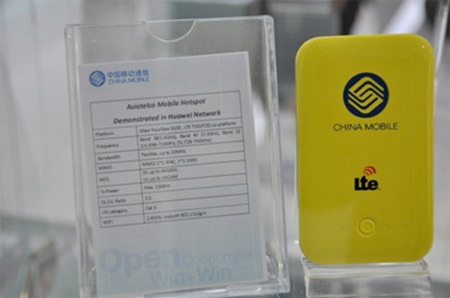 Specifications for the hotspot device were not provided, but Chinese news website http://www.gansudaily.com.cn published the picture above, which was taken at the recent ITU Telecom World event in Geneva. The Altair 3100 utilizes the company's proprietary O²P Software-Defined Radio (SDR), to support both FDD and TD-LTE in any band from 700-2700MHz. Altair also claims the capability for dynamic handover between FDD and TDD, a feature which could be especially important to Sprint with their recently announced multiband LTE strategy. Has Altair taken over the lead from Sequans to supply TD-LTE chips for China Mobile? Altair Semiconductor - Last (base)Band Standing?